Our autism school prides itself on offering a variety of ways to help treat autism. We are always researching ways to help the kids at the Autism Academy because we want them to reach new heights in education as well as their personal lives. If your child has autism and you’d like to enroll them into the Autism Academy, then reach out to our autism school to help your child excel. Over the past several decades, essential oils, or aromatic oils, have rapidly grown more popular amongst people of all walks of life who wish to enhance their environment, mind, and soul with healing fragrances. Whether it be lavender, lemon, or a host of other options, many people have found applying essential oils both to their skin and to their homes have a restorative effect on themselves and their families. Essential oils have been around for thousands of years dating back as far as 4500 B.C.E in Egypt. Essential oils were thought to have healing properties because of the plants they were derived from. Plants that are used to make essential oils were initially used for medicinal purposes as evidence shows in cave paints that can be dated back to 18,000 B.C.E. While there is an increasing number of essential oils aimed at actually improving mental and physical health — thieves oil, for example, is an antimicrobial, antiviral, antifungal, and anti-parasitic that can be placed in a diffuser, helping individuals who are sick with the flu — perhaps one of the most interesting developments has been an increasing awareness about how essential oils can help individuals with autism. 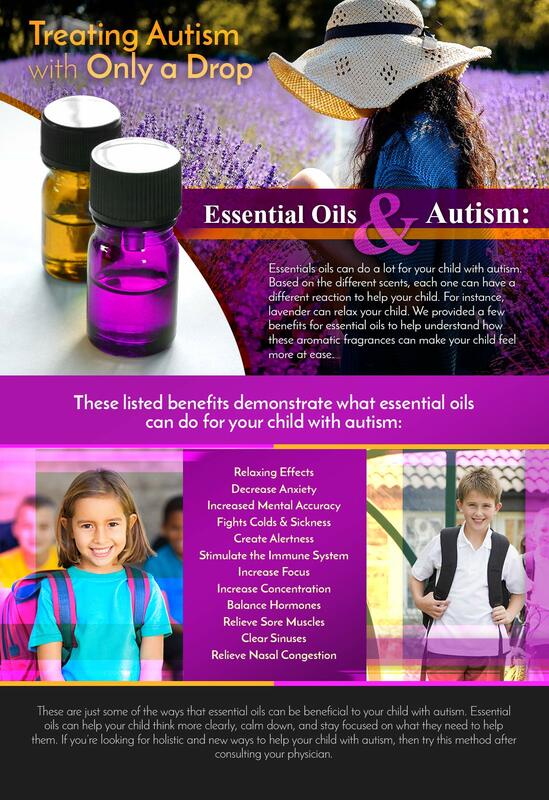 Simply put, essential oils are becoming an increasingly used technique for treating children and individuals with autism by identifying the oils that help maintain mental acuity and focus. They allow the mind to react positively and make reconnection with its surrounding. Furthermore, they ground and unite the body, mind, and spirit with reality, while also encouraging positive energy in times of restlessness and unease. In addition, they are an ideal substitute for children with autism, who have a difficulty swallowing pills. Finally, they can help an individual with autism to stay on task, release negative emotions, and promote higher thoughts of self-worth. Here are some of the choice oils that individuals with autism and families with children with autism might want to consider looking into. The oils can either be dispersed into the air or applied directly to the body, whether starting at the top of the spine and rubbed upwards, on the spine and ears, on the chest, or on the big toes, depending on the essential oil. Like most people on the spectrum, every oil should be considered on an individual basis. No two people on the spectrum are exactly alike, nor should they be treated as such. Vetiver: This oil helps quiet an overactive, exhausted, or stressed mind. Also, it is a great choice in helping to control anger, irritability, or neurotic behavior. Vetiver has the scent of a forest after the rain, with its earthy and damp scent. It helps to subdue an overactive, exhausted, or stressed mind, which many individuals with autism regularly experience. Cedarwood: This oil helps to stimulate pituitary and pineal glands. It can also aid in increasing melatonin levels naturally. In addition, it can help with good sleep at night and focus during the day. Frankincense: Extremely helpful in regenerating cells, calming and relaxing, and promoting higher levels of consciousness. Lavender: Lavender oil is ideal for bath time when the children are tired, stressed, or sick. Putting a few drops of lavender in the water can substantially help a child with autism calm down and get a good night’s sleep. Of course, before incorporating essential oils as part of your treatment regimen, you should always consult with your physician and/or therapist to ensure that this will be an effective addition to your child’s treatment regimen. For more information on our autism school and other related topics, continue to read our blog.